If you need to tie the vine shoots or small plants to the their stakes and supports, Pvc Pipes is an excellent professional product which allows easily this operation. Produced with plasticizer and nontoxic dyes, treated against anti UV and anti-freezing, it doesn’t release toxic substances or heavy metals. It is very light, it has elevated high breaking strength and an elongation of the 360% ca. For professional use, it stays soft even at low temperatures. Suitable for bindings with all types of climate. The company has developed a new tube with Biodegradable Bioplastics which is certified according to UNI EN14046: 2003 and ISO 14855:1999. Green Friend, this kind of tube has led our partners to create a new product that can be absorbed if filled in without toxic effects. Used in the vineyard or orchard it is not subject to degradation. This picture shows the high quality of our Pvc tubing over the years. You can easily tie vine-fruits and vine-shoots quickly! It stays soft even at high and low temperatures! Balls kg. 1 ca. with diameter from 1S to 4. 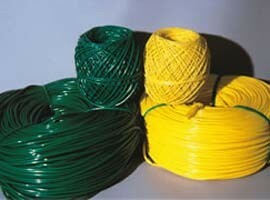 Virgin Pvc tubing green or yellow color, elastic and resistant, treated with anti UV and antifreeze. It doesn't release phytotoxic substances or heavy metals. For professional use. It also maintains soft to low temperatures. Suitable for durable bindings with all types of climate. Art. 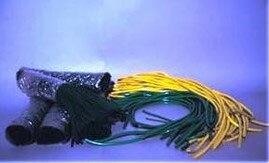 LEG/SL - "SL TOP"
Virgn Pvc tubing green or yellow colour. 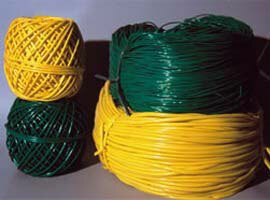 It is produced with plasticizing and nontoxic dyes, treated with anti UV and antifreeze. It doesn't release phytotoxic substances or heavy metals. It is very light, it has elevated breaking up loads and an extension of the 360% ca. For professional use. It also maintains soft to low temperatures. Suitable for durable bindings with all types of climate. 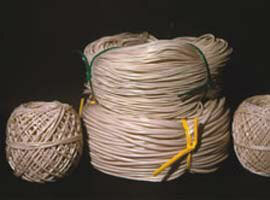 Virgin PVC tubing ivory colour. 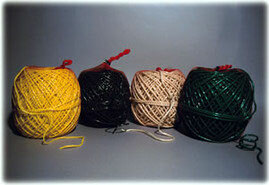 Produced with plasticizing nontoxic and natural dyes. This confers to our "LEGATOX" unique characteristics. It is a nontoxic product. It doesn't release phytotoxic substances, heavy metals, chemical dyes. It is very light (to parity of weight it develops around 10% more than our "SL"). It has high breaking-up loads and an extension of the 390% ca. For professional use. It also maintains soft to low temperatures. Suitable for durable bindings with all types of climate. 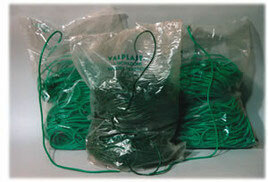 Clipped Pvc Tubing in simple bundles, different types of packaging, measures and colour. Lenght available: from 10 cm to 3 Mt. Easy bundle handling. It gets out from the bundle easily! Packaging: bundles different weights packed inot a bag of 20 kgs ca. Ball from 1 kgs, packed into a Plastic Net. Possible to hang on a belt. It gets out easily! put on a platte 500 kgs each. Practice packaging in Heat-Seal Bag 1 kg. each. The product goes out easily without ant efforts. For professional Use. 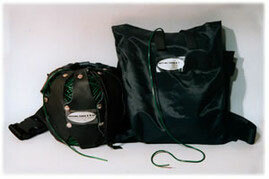 Possibility to advertise the bag. Available all kinds of Pvc Tubing - (economic in spring time only). From Diameter 1S to 4. For professional use made in skin, with proper adjustable belt 1,5 Mt. waterproof, with proper adjustable belt 1,5 Mt.